The Hokkaido JaLS JLPT course is specifically focused on intensively training to take the N3 or N2 examinations. Classes will be a maximum of 6 students, studying intensively through lessons with an experienced teacher. Although all students are welcome, this course is also especially suitable for students coming from countries where kanji is not used. The four-week course will study JLPT specific kanji, grammar, reading comprehension and listening exercises in detail. Lessons take place for 3 hours a day, however, the course involves a lot of homework, and students should be prepared for around 3 hours a day of necessary class preparation, homework and self-study. The school has a large private study room in the facility that you can have access to at any time for quite, focused preparation and our friendly team are happy to support you in any way possible. Classes are based on the practice and preparation you do each day, so this course is really tailored for those who wish to study especially hard for the JLPT. Let’s do our best to prepare as fully as possible! 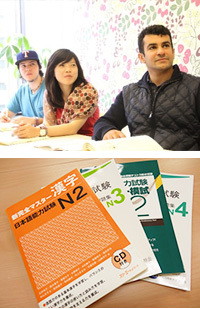 The courses are preparatory for passing JLPT N2 or N3 levels. This course is especially targeted for students coming from countries where kanjis are not used. In four weeks we will do kanji, grammar, reading comprehension and listening comprehension practices. Before coming to Japan there will be a Japanese level test that will measure your level in Japanese. At the day of the course completion we will do one more test to see if you have reached your goals and to find out the results of studying for four weeks. You can register to take the JLPT Test in Sapporo here http://www.jlpt.jp/e/ You are able to use the school address to register, but please contact us and complete your registration in advance. *Because this course is a four weeks package, participation is limited to people who are able to participate for four consecutive weeks. *■parts are all included in the fee. *Participating in after school activities or the one-day trip on Saturdays are free to choose. *Some activities will cost additional fees. Please do self-study in the morning at school or at dormitory because there will be a lot of homework. Alternatively you can also attend the standard course in the morning in which case you will be taking 6 hours of Japanese lessons a day. *■parts are Standerd Course fee. To strengthen the weak points of students from countries where kanjis are not used! 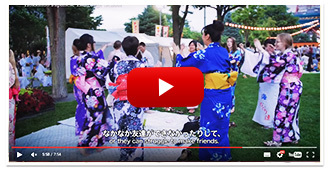 You can refresh during weekend activities and also interact with Japanese.